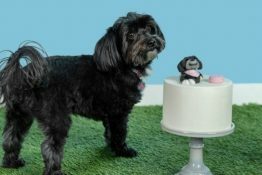 Daisy and I were recently introduced to a pawsome line of natural grooming and wellness products from HappyTails Canine Spa, and are super-excited to tell you about it! 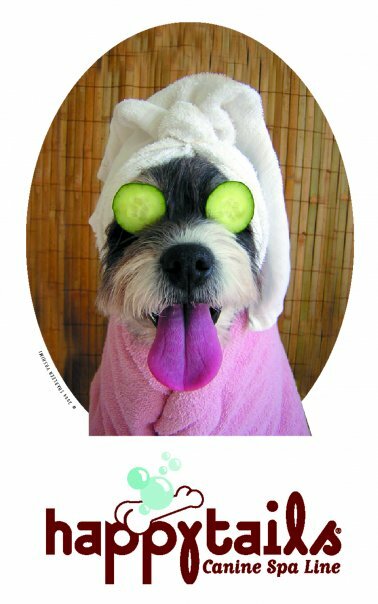 HappyTails creates eco-friendly spa, grooming and wellness products that are all-natural, and cruelty free. The first spa product we tried was Sparkle & Shine Shampoo, designed especially for light-colored dogs whose coats need brightening. Daisy was snow-white when we adopted her as a puppy, but over time her coat has dulled and I’d describe her more as “off white” these days. We’ve also been using medicated shampoo most of the time because she tends to have skin issues, but that often makes her fur a little coarse and in need of some special attention. 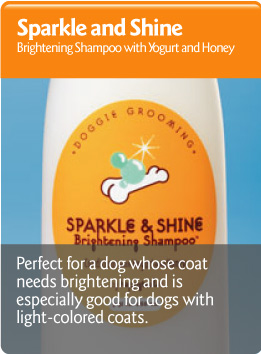 Sparkle & Shine contains pearlescent brighteners plus all-natural emollients including flax seed, yogurt and honey that combine to enhance the natural luminescence and silky texture of a dog’s fur, and to soothe and heal irritated skin. This shampoo is very gently (important with Daisy’s sensitive skin), and contains no SLS or Parabens. We also love that it is a tearless and easy-rinse formula! And did I mention that it smells GREAT, too!?! 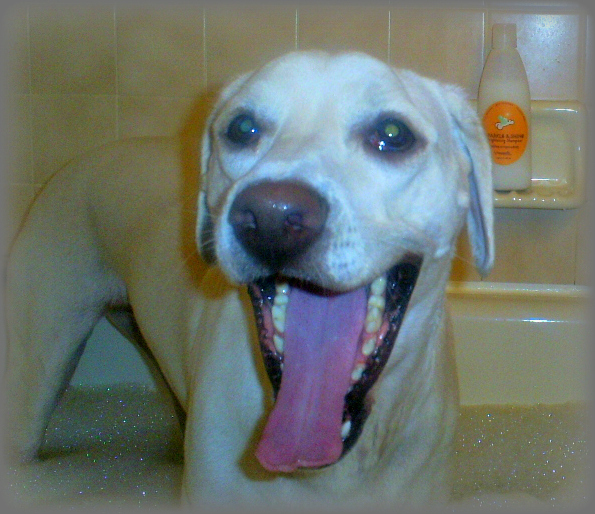 As you can see, Daisy thoroughly enjoyed her spa shampoo and bubble bath! The second product we tried was Sleepytime Tonic. Daisy can sometimes be anxious and get overly excited so the good folks at HappyTails recommended this to calm and relax her. 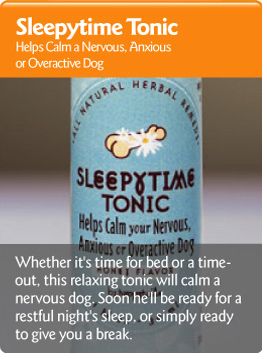 Not a sedative, Sleepytime is an herbal relaxation tonic made from natural ingredients, including Bach Flower Extracts, that helps dogs to feel more calm and less anxious. It’s really easy to use and comes with a plastic dropper. 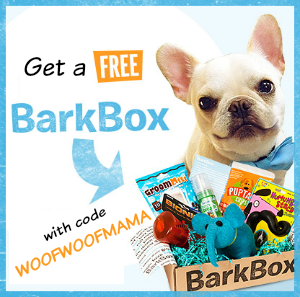 You just put a few drops in your dog’s mouth or on a treat.You can use it before trips to groomer, vet, fireworks, thunderstorms, travel and car rides. Daisy actually gets very nervous before bath time so we gave her some before her spa bath and it seemed to relax her and make it a more pleasant experience than usual. 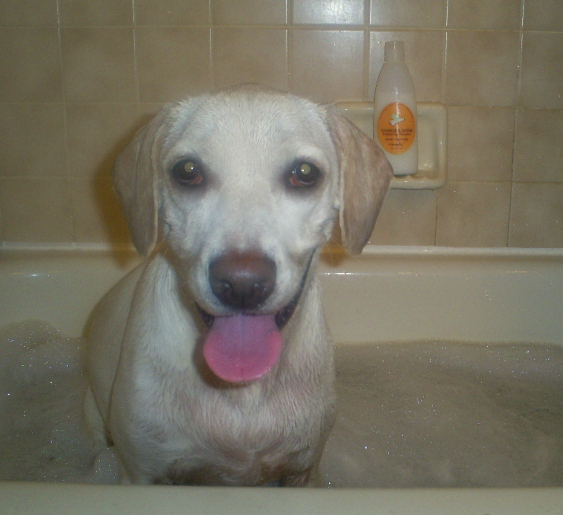 It sure helped since I needed her to stay still so I could get some photos of her in the tub, too! 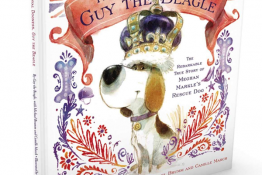 As a reader and fan of Woof Woof Mama and Daisy, you will have the chance to WIN these 2 great products along with LOTS MORE during a HUGE Giveaway event sponsored by HappyTails Canine Spa, May 15th-29th! Be sure to mark your calendar and tell your friends because there will be over 65 bloggers participating, so that means prizes galore! 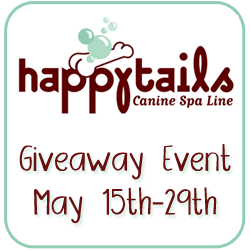 While you are anxiously awaiting the start of this event, be sure to drop by HappyTails Canine Spa and find out about all of their terrific spa and wellness products for dogs! Disclosure: We were provided with products to use so that we could tell you about our experiences with them. We were not compensated and all opinions are our own. Posts on this blog may contain affiliate links. 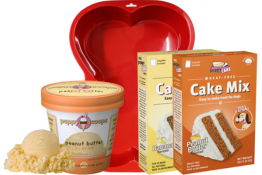 Note: I am only sharing my own experiences and opinions about these products. I do not make health claims nor give medical advice of any kind. 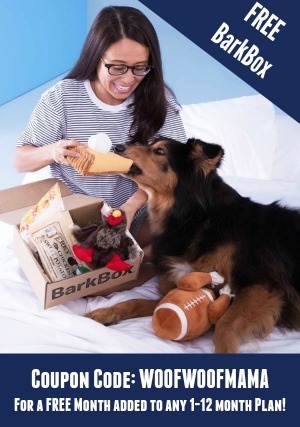 It is necessary for you to speak with your dog’s veterinarian or behavioral health professional regarding any specific conditions or products as they relate to your dog(s). I LOVE this shampoo. They also make great ear cleaning pads and a spray that makes Coco sparkle with little bits of glitter. I can’t seem to find sleepytime tonic … anywhere. could you pls. advise? thank you. Hi Belinda! Looks like they’ve discontinued the sleepytime tonic but try Bach Rescue Remedy. You can find it at Whole Foods, Vitamin Shops and natural pet stores. Just make sure you get the rescue remedy formula for pets NOT people.